Happy New Year from Poptropica! We hope you had a great 2012, and that 2013 is even better. We're looking forward to sharing a lot more great stuff with you on Poptropica in the coming year. Keep checking this blog for all the latest news and announcements. And thanks for playing Poptropica! I went to the mall to exchange some holiday gifts, but I got there too late. They were closed. Don't you hate that? It's not as though you can have any fun at the mall after it closes for the night. DECEMBER 27, 2012 -- Mews Foundation seismologists have verified reports of "sizable tectonic activity" taking place beneath the Poptropolis Games. "We've heard the stories about the island returning to the seas whence it came, but, frankly, we thought that smooth-talking emcee was just being dramatic," said Mews Foundation spokesperson Cheerful Spinner. "However, at this time we are not confirming that the Poptropolis Games are, in fact, on the verge of sinking back into the sea." When asked if the Mews Foundation was denying that such an event was taking place, Spinner had no comment. Congratulations to the first 10 finishers of Zomberry Island! Zomberry Island has been available to Members for just a couple of days, and already the Island Medallions are flying. As we always do with a new Island, we want to take a moment to salute the first 10 Poptropicans to complete Zomberry Island. Congratulations to everyone who has finished Zomberry Island so far, and to those yet to do so! DECEMBER 21, 2012 -- We are tracking reports of seismic activity in the North Poptropica Sea. Initial data indicates that the tremors are based in the proximity of the Poptropolis Games. Mews Foundation seismologists are en route to the location to investigate further. At present, there is no reason to fear widespread earthquakes or further damage to the Poptropolis ruins. What do you suppose all that's about? Is it the end of the world? Zomberry Island is now available to Poptropica Members! Zomberry Island is now available for Poptropica Members! Can you discover the source of the zombie outbreak, and find a cure? Visit Poptropica now to play Zomberry Island! Time is running out to try the Costume Closet for free! For the past few weeks, we've opened the Costume Closet to all Poptropicans. The Costume Closet allows you to save up to 30 individual costumes to retrieve any time. It's one of the many perks of being a Poptropica Member, along with Early Access to new Islands, unlimited use of all costumes and Gold Cards in the Poptropica Store, and full access to your photo album. But if you're not a Member, your free trial of the Costume Closet will be ending this Saturday, 12/22! All of your costumes will still be stored, but you will need a Membership to access them. Don't lose out. Find out how to become a Member today! We were pleased as punch to see that Poptropica Adventures made it to #1 on the Amazon sales rankings for Nintendo DS adventure games. Thank you to everyone who helped make that happen! We're glad you like it. If you haven't played Poptropica Adventures yet, it's available from Amazon.com. Or, it's not to late to add it to your holiday wish list! Poptropica: The Official Guide is now on your iPad! Now, there's a whole new way to get the inside scoop on your favorite Poptropica Islands with the new iPad edition of Poptropica: The Official Guide. 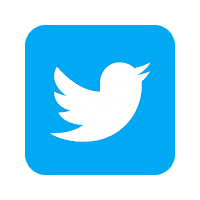 Enhanced and updated, the iPad version includes interactive elements like quizzes and slideshows, and high-res graphics that pop off the screen. If you haven't read Poptropica: The Official Guide, now's the time. Get Poptropica: The Official Guide for your iPad from the iTunes store! When can you play Zomberry Island? We bring you tidings of great joy: the release date for Zomberry Island! Early Access to Zomberry Island will be available for Poptropica Members next Wednesday, December 19. It will be open to everybody on January 10, 2013. Don't wait until next year to play Zomberry Island. Become a Poptropica Member today, and you'll be able to play Zomberry Island next week, and get your Zomberry extras right away! Poptropicans have been buzzing about the Lightning Knight costume they've been seeing around lately. If you want to become a Lightning Knight, all you need to do is get your copy of Poptropica Adventures for the Nintendo DS. It comes with two codes you can redeem for your character on Poptropica.com. You'll get the Lightning Knight costume, and the Medusa Surfer costume. These costumes are only available on Poptropica.com with codes from Poptropica Adventures, so get your copy today! Watch the Zomberry Island trailer! Zomberry Island is coming soon to Poptropica! Zomberry Island is coming soon! Members, get your Zomberry Island gear! New this week in the Poptropica Store, Members can get their exclusive Zomberry Island gear. Transform into a lurching beastie with the "Big Blue" zombie power. Create a halo of untouchable light with the Safety Flare. And suit up for the apocalypse in the dashing "ZMB Unit" costume. 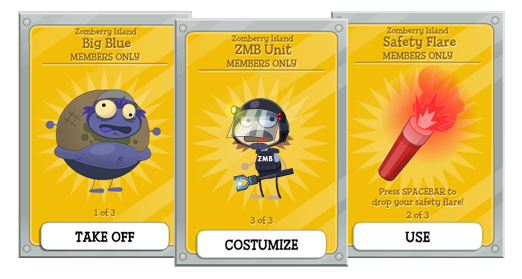 The ZMB Unit costume will only be available until the end of Early Access for Zomberry Island! If you're not yet a Poptropica Member, find out how to become a Member today. And keep an eye out for more news about Zomberry Island, coming soon to Poptropica! Charlie and the Chocolate Factory is now available to everyone! The gates are open, and you've got a golden ticket. Visit Poptropica now to play Charlie and the Chocolate Factory! Charlie and the Chocolate Factory opens its gates tomorrow for everyone! The wait is almost over. Charlie and the Chocolate Factory will be available to everyone tomorrow, December 6! Keep an eye right here -- we'll let you know the second it's available. For Members, that means you have one day left to get your exclusive Oompa-Loompa costume. Don't miss out! Zomberry Island is coming soon to Poptropica. The tale of a zombie outbreak in an innocent town will be chilling your bones before you know it, but do you want to know how it all began? We're proud to introduce the origin story: Zomberry: Day Zero!